Discover the English Fluency Bridge learning system in episode 15 of the Power Learning Podcast! n Episode 15, we finish the year-long fluency journey of our Master English Conversation Scholarship Contest winners, discuss the English Fluency Bridge learning system, and finally reveal the progress of all four winners! 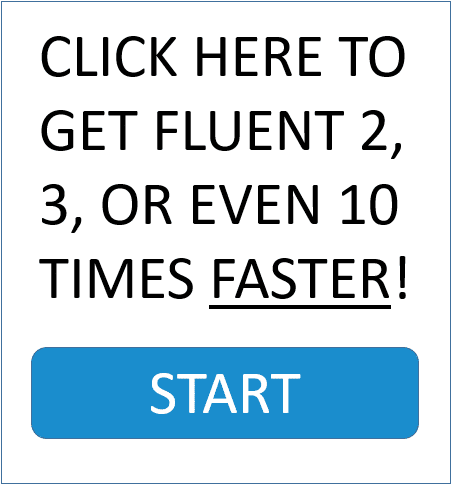 Listen to hear the great progress of Jaroslava, Yen, Carlos and Bhaskar, and learn to use the Fluency Bridge to get fluent and learn anything faster. Well, hello, and welcome to episode 15 of the englishanyone.com Power Learning Podcast. 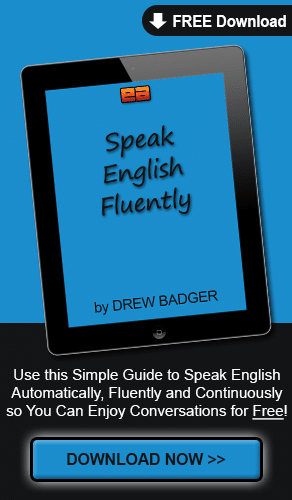 I’m Drew Badger, the Co-Founder of englishanyone.com, I’m an author, and an English speaking confidence expert, and today I’m excited to be joined by all four of the winners of the Master English Conversation Scholarship Contest. I’m really excited today, because they’ve just finished a full year of learning in the program. A year ago, we had a competition for a whole bunch of students to see who would be able to get, uh, free lessons. One of our Master English Conversation members was lovely enough and gracious enough to pay for one member to have lessons for a full year. So to kind of match that, uh, I also was willing to have, uh, an extra three people to go through the program, because I wanted to give everybody out there a chance to listen to speakers, both men and women, of different ages, and from different parts of the world, because each of them is coming from a different native language. So, after a full year, uh, we’ve finally come to the end. This is the last month, they’ve already finished the program. But about six months ago I decided kind of for myself and my team, uh, that if all four of them were able to do all of the, uh, the recordings each month, they have to continue to send me recordings each month and do the assignments, and continue to do the homework missions as well, if all four of them completed the full year, then I would give, uh, kind of lifetime membership to all four of them. So I’m really excited to announce that to them, uh, and to everyone else out there. It’s a…an admirable thing, and I’m so excited that I was able to pick four fantastic learners, and all four of them made fantastic progress, and made it all the way to the end. So it can be a very tricky thing for people trying to learn anything, or to lose weight, or to, you know, learn any kind of skill that takes a little bit of time to master. And, of course, they’re not perfect yet, they’re still on their way to fluency, but just to see the progress that they’ve made over the course of this year has been amazing. So you’ll get to hear all four of them today, but in the future as well in upcoming podcast episodes. I will be having conversations with them, just like I had in, uh, the 14th episode of the Power Learning Podcast with Jaroslava, so I will be joined by, uh, the other three winners as well. So you’ll get to hear them today, and then after that, uh, I will go back and give a few tips and kind of talk about the experience, uh, and wish them, uh, fantastic luck. Them and everyone else that’s learning out there. So today is really a, uh, kind of special episode, a congratulations for them, to celebrate all of the fantastic things that they’ve done, all the progress they’ve made, and to the future that they’ll have. All of the new opportunities that are open to them. Uh, I was just today listening to all four of their recordings, which I’ll play for you in just a moment, and each one of them has a great story, a, a new thing, uh, not only the English skill that they have, but also the confidence that they have now, and the opportunities that are coming their way. So I’m really excited about that. So right now, I’m going to let you listen to all four of them just give a final talk, their last recording, uh, and then after that I will come back and we’ll talk a little bit more about, you know, kind of some tips for them, uh, just to finish up with the Scholarship Contest winners. Enjoy. Yen:	Hi, my name is Yen, and I’m a member of Master English Conversation. If I’m not mistaken, this the last month I can study with free Master English Conversation lessons. I can make the argument that my English has improved a lot in just one year, and I can’t say thank you enough for your usefulness and…I also think that your program is getting better and better. So I guess it would be better if I tell you about a story from my own life. It was the very first time I have given a speech in front a large crowd. It took place about five months ago, when my class had a tour to visit [inaudible 00:04:32] international university. It was such a beautiful place, and the trip was just over the top. I was able to have a good time. I mean, just so wonderful to be there, you know, exploring university life, meeting a lot of handsome seniors. But the thing I like most is that I have a chance to express my strongest trait. There was the game, in each class is a team, and the game required each team to appoint a representative to make a representation in English about a topic, “Your Future Plan”. And my class chose me. In the first place, I totally confused, and I refused their request. Actually, I’m a very shy and a reserved type of person, and I didn’t think that I could get enough nerve up to speak in front of hundred people. But then again, I had a change of heart, because I thought that if I couldn’t do it, how could I put up with the tough future is waiting for me when I stay abroad? I spontaneously has…had more courage, and I wanted to challenge myself. Ultimately, I agreed to take the responsibility for presenting. I was totally unprepared, though, when they called my team’s name. I just went to the stage and talked about my real future plan. At the beginning I was shaking, and my voice trembled, but then I could, um, get a hold of myself and started to speak fluently and confidently. And you what’s…what amazed me? I was the winner. Can you believe it? I won at the very first time I ever joined a competition. It was just awesome, and I was super happy. This event make me believe in my ability, and help me be more and more confident in my [walks of life ?]. It was also a very memorable experience that I will never, ever forget. Thank you for listening. Bye-bye. Bhaskar:	Hello, friends. I’m Bhaskar from India. I am one of the four scholarship winners, and it’s been one years since being a member in English Anyone family. In this one, uh, one-year period, I have studied almost 25 awesome lesson sets, and I’ve learned a lot of new vocabulary, hundreds of phrases and expressions that we use in our daily life. What I secured from this course is amazing. The big steps I achieved that are able to think in English, speak confidently, and understand real English. Now, I am able to understand English movies and TV programs, and this is a big step. And I can understand real life conversations, almost majority of them. If you listen to my first recording, you can get how much I succeeded from this course. This course acts as a fluency bridge to get into real life English, from the non-native English, and my voyage through this bridge has got its benefit. And now, I am spending most of the day listening to real life English. And I have no problem understanding them at all. My speaking skills also improved a lot. Before starting this course, if I wanted to say something, I would have to prepare myself even for simple sentences, but now I can speak in a good way without any preparation, and without translating into my language. Carlos:	Hey, guys, how you doing? I’m Carlos. It’s been a year since I joined Master English Conversation class. I just going to say I really appreciate what you did, because my English was very kind of, uh…I was stuck all the time. I was thinking what I was going to say every time when I speak. So at this…at this…at this moment I feel like everything was worth it. As I said before, through Master English Conversation class, I had the opportunity to practice my English without no…Without fear. Um, even though I’m always afraid of making mistakes. But it’s, um, something that I can…uh, at this time I can deal with. So, thanks for that. Jaroslava:	Hi, Drew. This is the end my year study English with you. I am better speaker now, I have much more confidence to speak English, uh, but I am not only better speaker. Uh, special mission homework where I got it every month, uh, make me more confidence in my life. Uh, I know how to start conversation with other people. I have a few new friends. My business is better now. Uh, really. Clients pay me more money. It’s fantastic for me. Uh, and, of course, I will continue study English. It’s my new hobby to study English every day with you. It’s, uh, good for my brain. Uh, this week I have to learn some new things about computer and other technical things, because I have job interview tomorrow. And I was surprised, I, uh…how I study quickly. It’s like I was young in college. It was fantastic year with you. Thanks. All right. Well, uh, as I mentioned before, we look forward to having them in, uh, other kind of future podcast episodes as well, so we get to have actual conversations, and you can hear how they all sound. So, for the kind of final tip…Just a sending them off into the world, I feel like a parent, you know, they are leaving the home and they’re going off to study on their own. Now all of them are good enough to watch lots of movies and TV shows, and they can really, uh, get to this new next level of their fluency. So Master English Conversation’s been really helpful getting them to master the basics, uh, but also to really master the skills that they need, like being able to respond to people automatically and not have to think in their head in their native language and translate when they speak. Uh, they’re able to remember words now, and have more interesting conversations, and actually understand native speakers. So now that they’ve mastered all of these kind of essential pieces of fluency, they can go on to really learn a lot more in native English, without using lessons, really, and then they can go out and start actually meeting more people and improving their pronunciation the natural way. So, as I always say, too many students get focused first on trying to have good pronunciation before they can actually speak well, so master the basic and use the…uh, the lessons that I’ve been teaching over the course of the Power Learning Podcast. I recommend if you haven’t hear them already, to go back to lesson one, and you can listen to all of them. It’s over like a few hours now, I think, uh, of content, so there’s lots of things you can go through from the very beginning of their year. Uh, and for the first six months I had them, uh, joining me in the podcast episodes, and now I’m finally having them back, so you can listen to their progress. But I think they’ve done a fantastic job, and now they’re really ready to start getting to the highest level of advanced fluency where they can learn more in native English, but also improve their pronunciation and sound more like native speakers. So if that’s your goal, again, the way to do that is to master the basics, and then go on to enjoy fluency by listening to lots of different people, and then finding your own fluent, um…kind of finding your own voice, uh, to improve your fluency like that. So the last thing I’ll leave them with, and leave you, uh, out there, is remembering to use the fluency bridge when you practice. I just sent a mail out to, uh, a whole bunch of Power Learning members, and I was really excited because I had just taken a salsa lesson. So this is just kind of Latin dancing, salsa, and a few other things that I tried doing a few days ago. And what was interesting is that it’s exactly the same thing as learning how to speak an actual language. So you’re learning how to move, and when you dance, you know, this isn’t just learning some kind of dance where you do it by yourself, you actually have to communicate and work with another person. Now, you may not be speaking, but it’s steps that you have to do in a certain way, and you have to express yourself confidently when you dance. Especially as a man, because you’re the one leading your partner. So when I was doing that, I thought a lot about the same fluency bridge method that I use with Master English Conversation, and it works in exactly the same way. So what I’m going to explain first is kind of how the fluency bridge works, if you’re not already familiar with it, uh, but then encourage you to use that with anything that you’re learning in life, anything that you’re doing. So this is great advice for them as they’re beginning to learn more and their own, and for you as well, anyone listening out there. So the fluency bridge method begins…basically, it has two pieces. The first part is if you want to learn something, you need to get that actual thing first. So let’s say I want to become a better writer. Uh, I could learn how to write, uh, few things using a textbook, or, uh, I could get actually, you know, really good writing that other people have written, like, uh, like excellent novels, or other books, or anything else that is really good writing, and then I copy that, and I break it down into pieces, and I start studying how that’s good writing and why it works. And it’s really important to have a teacher, if you can, when you’re using the fluency bridge, because it makes everything a lot faster and easier to deal with. So that’s why I like Master English Conversation for actually being able to guide students as they learn and improve their fluency. But, uh, again, the two most important parts of the fluency bridge are not learning the textbook version of the thing you want to study, you have to study the actual thing, but you have to break it down into easy to understand pieces. Now, it’s interesting because I was, you know, I…this is…this idea of a fluency bridge, it’s, you know, it’s…it’s around in many different things. And I’ve just been recently reading Tim Ferriss’s new book, uh, “The 4-Hour Chef”, and he talks about the exact same thing. So when he’s talking about meta learning, or speed learning, or, you know, figuring out how to learn, how to learn better, so it’s learning how to learn, so you can learn anything faster and have speed learning, it’s exactly the same thing. You begin with the actual thing you want, whatever that is, so not the textbook version of it but the real thing, uh, and then you break it down into pieces. And then you figure out which are the most important pieces you need to study, and then study those. And the final part of his process, as well as my own, if you can figure something out, uh, is called the stakes. The stakes of something means if you say you’re going to do something you have to have, uh, a punishment if you don’t do it. So this is the stakes. Uh, and so, you know, like one thing he recommends is donating to a charity that you don’t like. You know, uh, as something like instead of you having to pay money you actually give money to like a bad charity, or something like you…you don’t dis…you know, you don’t really agree with. But the point is that the fluency bridge works in exactly the same way, and this is how you learn anything faster. So now, as the winners of the Master English Conversation Scholarship Contest, uh, have finished the program, and they’re going out not only to learn more native English, but also to learn anything else in life, um, I really want them and anyone else listening out there to always be thinking about that. Whatever you want to learn, focus on learning the real, actual, native, true version of it, but if you can, have someone that can break it down for you, or even just kind of take your time to break it down yourself. It was tricky for me to learn Japanese, because basically I had, uh…I had to kind of break down the language on my own. I had to listen to the different flow of the way Japanese is, and how it’s different from English, and then I had to, uh, break down the grammar and the way the native speech and the, uh, you know, the kind of patterns and the…the rhythm and all of those things that come with Japanese and how it’s different from English. So when I was listening to those things, I had to…you know, I would ask other people for help but I didn’t really have a teacher to teach me those things. So now that’s why I’m so excited to be a guide for so many students, because I’ve done it with Japanese and I’ve learned to speak, uh, confidently. I can go out and have conversations with anyone, and even though I may not be perfect, and even though I’ll make a mistake now and then, um, I really enjoy speaking with people. And I can learn a lot more in conversations that way. So now that’s why I’m so excited to be a guide and offer that to people that want to learn more about how to get fluent in English faster, Because, really, it’s a very easy process of learning the right thing, in the right way. So not learning the textbook version, because that’s basically incomplete. The traditional English learning methods that most students use, they only teach you maybe half of what you need for fluency. And part of that is, you know, learning to read and write and understand slow, easy English, but most of the time those students are never taught how to understand native speakers because they don’t really listen to that. They don’t really learn native English, and they also don’t really get much practicing, uh, of speaking. So one of the things that you needed to do, again, is find, if you can, a mentor, uh, or a teacher that can work with you personally, uh, or use a program like mine when you’re trying to improve your English. But for anything you’re learning in life, figure out what is…what is the ultimate thing you want, and then break that down into pieces, and then use the fluency bridge to get there. So for you learners out there, uh, and you teachers as well, anything that you’re teaching, make it simple and easy, because if you can break something down into really easy, simple pieces, then each one of those things becomes really easy to do. You build a lot of confidence quickly, and then you can go on to achieve and get faster results. So, uh, for everyone listening out there, remember the fluency bridge. And for my four winners of the Master English Conversation Scholarship, I’m so excited with your progress. I really want to, uh, hear more from you in the future, and I look forward to having conversations with you and then releasing those on YouTube. Uh, just have a fantastic day. Again, this has been more of a…kind of a congratulations episode. I’ve been really excited just to…just to hear the stories that they’ve had. And I encourage you to go back and listen to how these language learners were speaking when they first started a year ago. Each one of them has made progress in their own way, and some of it has been mental, and some of it has been actual language learning, but each of them has made fantastic progress, and I’m so excited with what they’ll be doing in the future. Well, I hope you’ve enjoyed this episode of the Power Learning Podcast. If you’d like to learn more about Master English Conversation, please come to englishanyone.com. And if you’re watching this on YouTube, you can click on the button right in this video to get our free guide to meeting native speakers, plus our guide to confidence, and, uh, why learning is such an important thing to be doing right now for success in the global economy, all of our free video lessons. It’s a fantastic set of Power Learning, uh, video lessons that I’m really excited to release to everyone, and all you have to do is click on the link, and come to englishanyone.com, and you can get them for free. Well, I look forward to seeing everyone, uh, at englishanyone.com, and I look forward to lots of new Power Learning Podcast episodes in the future. Have a fantastic day, and I’ll see you next time. Bye bye.